On his second full-length, Rick Bain, along with his band, The Genius Position, deliver a spellbinding collection of Brit-pop infused with psychedelic rock and folk, making Virtual Heavy Pet one of the best records of 2004. Kicking it off with the trail-blazing "Welcome To My Daydream", Rick Bain and the Genius Position have no problem reeling you in, the guitars on fire and the rhythm section laying down a sturdy, pounding force. Bain's voice enters and the song drags you in even more, as you give in and start singing along. Then, as soon as the hook hits you, you're out cold, Bain victorious. The chorus has you completely sold, if you weren't sold before, and you bask in the hard-hitting pop and Brit-rock that Bain thrives at. "Is It That Hard" hits you next, a dazzling keyboard signaling the song's start, Bain's hazy vocals chiming in, and his ability to spin an infectious hook out of an otherwise dark piece uncanny. The verses seem a bit morose, while the uplifting chorus, a glowing pop melody proudly present, carries the song into a different direction, giving it much more for you to chew on. "You're Right" finds Bain experimenting with early British folk, before allowing his Brit-pop tendencies to overshadow it, catapulting the song into the rock stratosphere. Meanwhile, "Amy Jane", the album's standout track, a delicate balance between Brit-pop and indie-rock, leaves little doubt at Bain's ability to craft, quite possibly, one of the most memorable pop songs of the Brit-pop and indie rock worlds. "Amy Jane"'s regretful, sorrow-filled verses detail the breakdown of a relationship that just can't be, no matter how hard one side works. "I can feel myself slip, thinking we could work it out. Then I remember, what you want is not me, I could never really be a comfort to your soul. Now I'm flirting with disaster, coming on too strong. Then I kiss you too hard," Bain sings, wanting, almost needing to have the relationship work, before wising up and realizing he feels this way every time things fall apart, and it just won't work. The latter half of the record explores the folk and psychedelic side of things more. With tracks like "Glad That It's Over", "Black Apple Orchard", and "Unchained Anti-Melody" showing the softer, less rocking side of Bain, but bringing to the forefront (even more so) his ability to write soaring melodies and undeniably infectious hooks. Taking things even further with "Sorrow River" and "How It Comes To Be That Water Runs", Bain turns to the blues to create, infusing his songs with a strong sense of blues, and giving his songwriting a stomping, swampy, muddy feel, and thus another dimension. He's toured with friend Courtney Taylor-Taylor's band, The Dandy Warhols (the drummer for the Dandies actually drums for Rick Bain now), but one listen to Virtual Heavy Pet will prove to almost anyone that Taylor's band should be opening up for Bain. 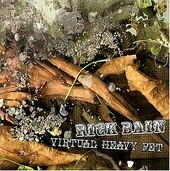 Highly underrated, Virtual Heavy Pet is Bain's swan song, and, if people listen, his ticket to the deserved stardom. I'll give the record an A.